This webpage is a summary of: Chuvashova et al., Holocene volcanism in Central Mongolia and Northeast China: asynchronous decompressional and fluid melting of the mantle, J. Volc. Seis.,1, N 6, 372-396, 2007b. Volcanic eruptions in Central Mongolia during the latest Pleistocene and Holocene preceded an initial Holocene volcanic event of 8740 ± 400 BP in NE China and terminated simultaneously with that event as inferred from 14C dating. Alkaline magmatic material was erupted in Taryat, Central Mongolia first along an EW line of volcanoes and afterwards along a N-NE line. Partial melting in a mantle source of 1.5–3.0% was followed by increasing melting of up to 5%. Similar material was erupted in Jingpohu, NE China, 5430–4400 BP. Initial melting of ~2% beneath the Frog Pool volcanic center and ~5% beneath the Crater Forest volcanic line was followed by variable melting beneath the latter. The final eruptions were the products of ~5% partial melting. The liquids of Central Mongolia and NE China were derived from closed (homogeneous) and open (heterogeneous) mantle sources, respectively. Unlike the former, the latter resulted in wide variations in the isotopic compositions of Sr, Nd, and Pb and their depletion in high-field-strength elements (Nb, Ta, Ti). We suggest that the mantle magmatism of Central Mongolia and NE China was governed by different mechanisms–adiabatic decompressional melting in the former region and fluid-fluxed melting in the latter. Decompressional melting resulted in short-term syntectonic volcanic episodes at ca. 70-50 ka and 8.8 ka, whereas the fluid-fluxed melting characterized the Holocene volcanic activity and was delayed relative to the latest magma-generating tectonic event in Asia. This webpage is a contribution to the plume debate in Asia. Hypotheses on the causes of Cenozoic tectonic activity in Asia have a long history of debate. In the late 1980s, the lower mantle beneath this region was defined seismically as a high-velocity region similar to that beneath North America (Castillo, 1988). This suggested that central Asia could be the geodynamic opposite of SOPITA, the “South Pacific Isotopic and Thermal Anomaly”, considered to be underlain by low-velocity lower mantle, upwellings, and multiple plumes (Staudigel et al., 1991). Nevertheless, in the early 1990s, in spite of the major differences, Morgan's innovative idea of convective plumes in the lower mantle was arbitrarily transferred to Asia to explain the diffuse Cenozoic magmatism there. During the last decade, however, evidence has been presented relating this magmatism to upper mantle processes only. The significance of shallow-mantle magmatic sources has been emphasized for central Mongolia, e.g. by Barry et al. (2003, 2007), Rasskazov et al. (2003) and Bayasgalan et al. (2005). High-resolution tomography from surface-wave data (Yanovskaya & Kozhevnikov, 2003) has revealed velocity variations including the Transbaikalian low-velocity domain (200-350 km depth) and the Sayan–Mongolian, Okhotsk Sea, and Philippine Sea low-velocity domains (50-200 km depth). The Transbaikalian domain appears to be related to Late Phanerozoic subduction of oceanic plates beneath East Asia. The Sayan–Mongolian domain also could originate from long-term geological processes but it was obviously influenced by Cenozoic processes connected with Indo-Asian collision (Rasskazov et al., 2003; Rasskazov & Taniguchi, 2006). We reported the results of a comparative study of the youngest volcanic rocks from Central Mongolia (Taryat) and NE China (Jingpohu and Wudalianchi; Chuvashova et al., 2007b). Place names used in this webpage are shown in Figure 1. The volcanic areas of NE China are in front of the currently active Pacific slab, which is subducted beneath Eurasia. A stagnant slab is known to exist there as a high-velocity anomaly in the mantle transition zone at depths of 410–660 km (Fukao et al., 1992). The NW edge of the high-velocity anomaly is advanced inland relative to the Pogranichny gravity step of East Asia by ~ 300 km. Wudalianchi is immediately E of the Pogranichny gravity step, and Jingpohu and Changbaishan are closer to the continental margin (Figure 1). The goal of this webpage is to define the main features of coeval deep-seated magmatism in the latest Pleistocene and Holocene in Central Mongolia and NE China. Figure 1: Latest Pleistocene through Holocene volcanoes in low-velocity domains. Modified after Rasskazov et al. (2004); Rasskazov & Taniguchi (2006), and Chuvashova et al. (2007b). Click here or on figure for enlargement. 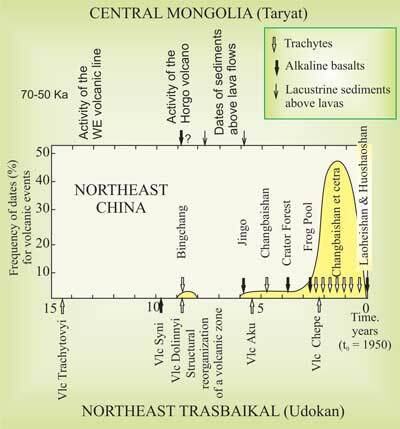 Late Pleistocene through Holocene volcanism in the Udokan Range, N Transbaikal is well dated by 14C (Rasskazov, 1999). Thus we use this area as a standard for comparative studies of late volcanism elsewhere (Figure 2). The Trachytovyi and Syni volcanoes that were active 14,400-9,800 BP discharged magma through NW-SE fissures and the Dolinnyi, Aku, and Chepe volcanoes which were active ca. 8,800-2,200 BP. The direction of crustal extension changed at ~ 8,800 BP. The upper time limit for the discharge of lava flows in Taryat is defined by 14C dating of organic material from the lacustrine sediments overlying the lavas: 4,930 ± 150 BP (Logachev et al., 1982) and 6,890 ± 400 BP (Devyatkin, 2004). The eruptions themselves have not been dated. Their timing is estimated by assuming that the rearrangement of Holocene volcanic zones in Taryat and Udokan occurred simultaneously. The lower time limit for the Khorgo eruption and the flows that flooded the area is taken to be the eruption time of Dolinnyi Volcano, which marks the structural rearrangement of the Udokan volcanic zone at 8,780 ± 260 BP. It seems Khorgo Volcano erupted 8780–7710 BP. Eruptions on the EW volcanic line in Taryat are compared to earlier eruptions in the Udokan Range 14,400–9,800 BP. According to disequilibrium U-Th dating, eruptions of Odnobokii, Listvennichnyi, and Sosnovyi volcanoes occurred 70-50 ka (Chuvashova et al., 2007a; Rasskazov et al., 2008). Figure 2: Temporal relations between volcanic eruptions in NE Transbaikal, Central Mongolia, and NE China (14C calibrated ages). Forty-four volcanic events were defined in NE China based on archival records of historical eruptions and 14C ages. The earliest eruption of trachyte pumice from Bingchang Volcano in southern Jilin Province occurred at 7,854 ± 180 BP (Zhang et al., 1996), the same as Dolinnyi volcano. The latter was also trachytic pumice. Holocene volcanism in NE China began simultaneously with structural reorganization of the Udokan volcanic zone. In Jingo, Jingpohu, and Changbaishan volcanoes, eruptions occurred 5,910–4,400 BP. The 14C date for the former is 5,140 BP (Zhang et al., 1991). The Crater Forest line in the Jingpohu area has three 14C dates: 4,630 ± 60 BP for the northern end of the line and 3,950 ± 70 and 3,970 ± 70 BP the central part. A 14C date of 4,460 ± 80 BP was obtained for Frog Pool volcanic center (Zhang et al., 2002). The eruption time of Frog Pool volcanic center is thus comparable to that of the northern Crater Forest line. Jingpohu volcanism occurred in three cycles. The first and second occurred in the Crater Forest line and Frog Pool volcanic center, while the third was confined to the Forest line (Zhang et al., 2002). A date of 4,105 ± 90 BP was obtained for trachyte pumice N of Changbaishan Volcano (Liu & Taniguchi, 2001). The interval of volcanic activity in NE China, 5,910–4,400 BP, is comparable to the eruption of trachyte ffrom Aku volcano in the Udokan Range. For later eruptions at Changbaishan Volcano, 22 14C dates gave a total age range of 2,420 ± 95 to 910 ± 45 BP. There are historical records of eruptions on Changbaishan, with the last event in 1903. A magma chamber was detected by electromagnetic soundings and S-wave recordings at 15–25 km depth beneath Tianchi Crater (Liu & Taniguchi, 2001). The beginning of frequent activity in Changbaishan was approximately simultaneous with an eruption of Chepe Volcano in Udokan. In addition to similar trachyte compositions of pumice in the Holocene volcanoes of NE China and NE Transbaikal, the approximately simultaneous resumption of volcanic activity in these regions since ca. 7,780–7,740 BP is noteworthy. One difference occurred from 2,500–2,200 BP; unlike the Udokan volcanism, which terminated with eruption in Chepe Volcano, Changbaishan volcano entered a phase of frequent activity that continues to the present day. Recent activity in Wudalianchi was recorded in Laoheishan and Huoshaoshan volcanoes. According to historical Manchu archives, the former became active January 14, 1720, and ceased erupting before the end of March 1721. The latter began erupting in April 26 and ceased in June, 1721 (Liu & Taniguchi, 2001). Figure 3: Na2O+K2O and K2O/Na2O versus SiO2 in volcanic rocks from Central Mongolia (a, b) and NE China (c, d). Data sources for c and d: Hsu et al. (1998), Wang et al. (1996), Zhang et al. (1995), Zhang et al. (2002), and Zou et al. (2003). Dividing lines in a and b are shown according to the IUGS classification. The compositions have been recalculated to 100% on awater-free basis. 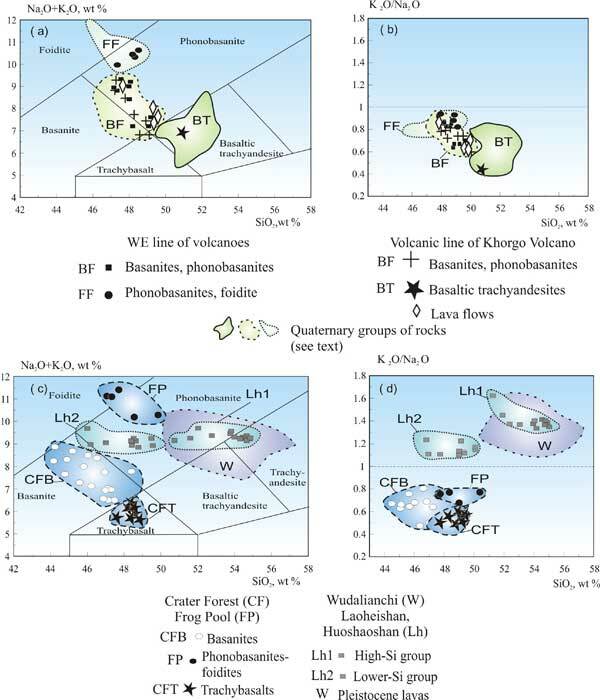 The Quaternary volcanic rocks of Taryat consist mostly of basanites, phonobasanites, basaltic trachyandesites, phonobasanites and foidites (Figure 2). The lower limit of the Quaternary volcanic sequence with elevated 87Sr/86Sr ratios (0.7052–0.7053; Chuvashova et al., 2006) is 1.9 Ma lavas. Values of the Mg# = Mg/(Mg + Fe2+) are generally higher in the basanite-phonobasanite group than in the phonobasanite-foidite and basaltic trachyandesite groups. The concentration of Ba in all three groups varies within 500–800 ppm. Zr is lower in the basaltic trachyandesites than in the basanite-phonobasanite group and higher in the phonobasanite-foidite group. Variations of major elements in Jingpohu and Taryat lavas are similar (Chuvashova et al., 2007b). The volcanic rocks of Crater Forest range from foidites to trachybasalts, with lower SiO2 than Taryat rocks. The phonobasanite-foidite group from Frog Pool is comparable with that of Taryat. The K2O/Na2O ratio in Jingpohu rocks varies from 0.47 to 0.80 and overlaps the range found in Taryat rocks. The Mg# (60.8–67.0) is elevated in Crater Forest basanites and decreases to 59.3–61.4 in the trachybasalts. It is as low as 47.1–49.1 in the Frog Pool phonobasanite-foidites group. The Jingpohu volcanic rocks have comparable Ba to the Taryat rocks. Volcanic rocks from Wudalianchi have different major and trace-element characteristics from Taryat and Jingpohu rocks. Unlike Central Mongolia, rocks from NE China correlate poorly in trace elements. Elements such as Rb, Ba, K, U, Ta, Sr, and Nb display significant differences from La. Strong trace-element variations suggest different magmatic sources. This is of particular interest for Laoheishan and Huoshaoshan volcanoes which yield specific compositions uncharacteristic of the earlier Quaternary volcanism in Wudalianchi. With the homogeneous trace-element data for Taryat melts, we obtained reliable direct and inverse modeling results for equilibrium partial melting. We also calculated a model of fractional partial melting using equations of Shaw (1970). The direct equilibrium modeling, consistent with the results of the inverse modeling, yield a composition of a metasomatized mantle source containing olivine (41%), orthopyroxene (20%), clinopyroxene (30%), garnet (5%), phlogopite (3.4%), ilmenite (0.5%), and apatite (0.1%). The results are illustrated in the (La/Yb)N vs. YbN diagram (Figure 4a). The phonobasanite-foidite group from the EW volcanic line resulted from 1.5–2.0% partial melting. Some basanite and phonobasanite melts are produced by higher degree of melting, but do not exceed 3.0%. The melts of the N–NE volcanic line belong to the same mantle source but with higher degrees of partial melting (2.0–2.5%), except for two points that fall in the interval 5–10%. The higher Yb concentrations in the basaltic trachyandesite from Khorgo crater suggest garnet content in the mantle source decreasing from 5 to 3%. This degree of melting is comparable to that of the Khorgo line. Direct modeling shows that the Jingpohu rocks came partly from a similar source to the Taryat rocks. The Crater Forest basanites mostly lie along the line of the source with garnet concentration 5% at degrees of melting 2–5%. Unlike the Taryat source, the Jingpohu source lacks ilmenite. The Crater Forest trachybasalts were derived by melting approximately 5% of the mantle source with 3% garnet, similar to the basaltic trachyandesite from Khorgo Volcano. Some Jingpohu rocks show low Yb concentrations. These belong to the phonobasanite-foidite group of the first and second cycles of activity of Frog Pool volcanic center. Such sources had a garnet concentration of ca. 8%. According to the equilibrium melting model, partial melts produced during the first eruptive cycle were ~ 2% beneath Frog Pool Volcano and ~ 5% beneath the Crater Forest line. During the second eruptive cycle, the degree of melting beneath Frog Pool remained the same, while varying between 2 and 5% beneath Crater Forest. During the third eruptive cycle, the degree of melting beneath Crater Forest increased to 5%, with garnet concentrations between 3% and 8%. The equilibrium melting model assumes variations at the source of Wudalianchi Quaternary melts of garnet concentration 5-8% at melting degrees of 0.5 - 1.8%. Laoheishan and Huoshaoshan volcanoes correspond to garnet concentrations of ~ 5%. 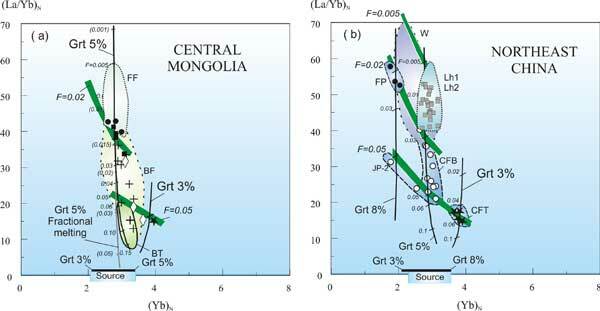 Figure 4: (La/Yb)N versus (Yb)N in volcanic rocks from (a) Central Mongolia, and (b) NE China. The calculated lines of partial melting for sources with varying garnet abundances are shown. The compositions have been normalized to undifferentiated mantle (McDonough & Sun, 1995). Strong collision-related compressive stresses affect the lithosphere of Central Mongolia and the southwestern Baikal Rift System and are expressed in volcanic episodes. In intra-continental areas and the E and S convergent zones of Asia, volcanic episodes were not coeval 2.0–1.5 Ma but synchronized subsequent to ca. 1.2 Ma. This change marks a transition from independent to closely connected interplate and within-plate processes (Rasskazov et al., 2000). Melts from the isotopically-rich magma source (87Sr/87Sr 0.7052–0.7053) that erupted in Taryat at ca. 1.9 Ma were followed by melts with enriched compositions (87Sr/87Sr, 0.7046–0.7047) and varying Sr content (625-2000 ppm). The increasing Sr abundance from the basaltic trachyandesite group through the phonobasanite-foidite group, with concurrently increasing (La/Yb)N, indicates that it enriches low-volume partial melts. The fixed values of 87Sr/87Sr at varying degrees of partial melting reflect the source homogeneity and not the involvement of components from other sources. Liquid evolution can be explained by melting a local mantle volume by syntectonic adiabatic decompression. Melting results from the movement of material to a region of lower pressure. During the last 1.2 Ma, the collision-related tectonic regime favored multiple eruptions in the Taryat basin controlled by EW-trending tectonics with sinistral strike-slip displacement. This zone extended for over 80 km. The strike-slip regime alternated with increasing extension in a direction orthogonal to the collision-derived stress. EW conduits discharged magma with a low degree of partial melting (1.5–3%) and a north–NE conduit with higher degree (up to 5%). Lavas of the Laoheishan and Huoshaoshan volcanoes show an excess of 230Th relative to 238U (230Th/238U = 1.24–1.33). The increase of 230Th/232Th with increasing K2O and 87Sr/87Sr and decreasing 143Nd/144Nd and 206Pb/204Pb suggests isotopic and elemental heterogeneity of the mantle source during the last ~ 350 ka. Garnet peridotite and metasomatic materials were components. The isotopic heterogeneity could not be due to mixing of magma from two isolated mantle regions. It resulted from transport of material into the melting peridotites (Zou et al., 2003). 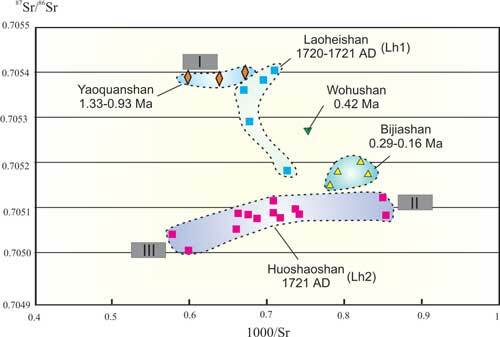 The lavas of Laoheishan and Huoshaoshan volcanoes is comparable to the Quaternary Wudalianchi lavas, while the presence of the Lh2 compositional group, absent prior to the 1720–1721 eruptions, shows that the magmatism changed drastically relative to the preceding Quaternary magmatism. Since the data do not show any significant displacement towards depleted sub-lithospheric mantle (Figure 5b), any relationship between the special composition of the Lh2 group and an increased supply of deeper material is ruled out. The relatively decreasing role of garnet (Figure 5b) indicates present-day generating liquids in the upper part of the magmatic region. Figure 5: 87Sr/87Sr vs. 1000/Sr for volcanic rocks of central Mongolia and NE China. For legend see Figure 3. (a) a basaltic trachyandesite field (BT), 1.9 Ma. The decrease of 1000/Sr in volcanic rocks 1.2 Ma and younger is consistent with decrease of the degree of partial melting at the mantle source. (b) the components EM(ZH) - slightly enriched Jingpohu mantle component, EM(W) - more enriched Wudalianchi component, DM - depleted component represented by the Nushan, Fangshan, and Tashan basalts. Compositions of the Nushan lavas are shown by oblique crosses, after Zou et al., (2000). Temporal volcanic evolution in Wudalianchi (Wang & Chen, 2005) showed a change of sources with a key role being played by the volcanoes Yoquanshan (K-Ar dates 1.33–0.93 Ma), Bijiashan (0.87–0.16 Ma) and Laoheishan and Huoshaoshan (final eruptions 1720–1721 AD). Based on new analytical results we found successive melting of three mantle components: 1) initial, 2) intermediate, and 3) final, exhibited by eruptions with relatively high 87Sr/87Sr (0.705388–0.705402), K2O (5.5–5.9 wt%), intermediate 87Sr/87Sr (0.705160–0.705211), K2O (4.4–4.6 wt%), and lower 87Sr/87Sr (up to 0.705054), K2O (up to 4.1 wt%), respectively. During the 1720-1721 AD episode, mixing of the two former components in lavas of the Laoheishan volcano was followed with mixing of two latter ones in lavas of the Huoshaoshan volcano (Figure 6). Although the liquids of the Crater Forest and Khorgo volcanic lines are similar in terms of composition and degree of melting at the mantle source, the similarity is incomplete. The depletion in high-field-strength elements (Nb, Ta, Ti) shows that Jingpohu alkali lavas were produced by melting of mantle rocks with the involvement of aqueous fluids. The isotopic heterogeneity of Jingpohu alkaline basalts is expressed in the 87Sr/87Sr vs. 1000/Sr plot. Figure 5b shows a trend of data between depleted and enriched mantle components. The former, similar to the Nushan, Fangshan, and Tashan basalts represents material of the sub-lithospheric mantle, the latter, similar to the mantle component of Taryat, exhibits the metasomatized garnet peridotite. The liquids derived through the higher degree of partial melting beneath the Crater Forest line fall at the mixing line, whereas decreasing degree of partial melting is expressed by a shift of points to the left. Taking into consideration depletion of the Jingpohu volcanic rocks in high-field-strength elements, we suggest that the isotopically-depleted component was brought into the peridotite by aqueous fluids. The Crater Forest rocks contain a 10 to 50%, and the Frog Pool rocks 20–30%, admixture of the isotopically depleted component. In contrast to adiabatic decompression melting due to the intrinsic heat of the system, the fluid fluxing mechanism of melting in the mantle seems to favor sustained magma generation. Figure 6: Source heterogeneity in 87Sr/87Sr vs. 1000/Sr space for volcanic rocks from Wudalianchi. I-III – mantle components: I – initial, II – intermediate, III - final. Data sources: Zhang et al. (1995), Zou et al. (2003) and unpublished results of the authors of this webpage. Timings of the latest Pleistocene through Holocene volcanic eruptions in Central Mongolia, Northern Transbaikal, and NE China show close links. We speculate that the regular temporal relations of volcanic events were governed by a common trigger, which might be a strong tectonic pulse propagating from the Indo-Asian collision zone. We connect the maximum tectonic stress with structural reorganization of the volcanic zone in Udokan, Northern Transbaikal at 8,780 ± 260 BP. In Taryat, Central Mongolia the volcanoes Odnobokii, Listvennichnyi, and Sosnovyi of the EW volcanic line were active at ca. 70-50 ka, i.e. before the reorganization, while eruptions on the N-NE line of Khorgo volcano and related flows occurred either at the time of the structural reorganization or shortly after. In NE China, Holocene volcanism initiated at 8,740 ± 400 BP, i.e. simultaneous with the structural reorganization in Udokan. The frequency of eruptions increased in NE China at about 2,500-2,200 BP, i.e. at the time of the latest eruption in Udokan. Volcanic activity was constrained in Jingpohu in the time interval 5,430–4,400 BP and was recorded in Wudalianchi in 1,720-1,721 AD. Similar ranges of rock compositions were found in Taryat, Central Mongolia and Jingpohu, NE China. In the former area, the basanite-phonobasanite group was sampled both in the EW and N–NE volcanic lines. In addition, the phonobasanite-foidite group was identified at the EW volcanic line and the basaltic trachyandesite group in the N–NE line. In the latter area, the early eruptions at Frog Pool volcanic center were compositionally similar to those from the EW volcanic line of Taryat, whereas the later lavas from Crater Forest line were similar to those from the N–NE line of Taryat. The eruptions of Laoheishan and Huoshaoshan volcanoes were characterized by high-K compositions and other geochemical characteristics, which are generally typical of the Middle Miocene through Quaternary lavas from the Erkeshan, Wudalianchi and Keluo volcanic fields. Both in Central Mongolia and NE China, magmatic liquids appear to be derived from metasomatized garnet-bearing peridotite sources located at depths of 80-120 km. Magma generation in the former region was dominated by a single homogeneous source and in the latter by mixing of different components. Volcanic rocks from Central Mongolia have high correlation coefficients for incompatible elements and narrow isotopic compositions of Sr both for the Quaternary and latest Pleistocene through Holocene units. Thus, the latest Pleistocene through Holocene lavas discharged from the mantle source that developed as a closed system since ca. 1.2 Ma. In contrast, volcanic rocks from NE China have poor correlation between incompatible trace elements and wide variations of 87Sr/87Sr, 143Nd/144Nd, and 206Pb/204Pb. This heterogeneity indicates melting in an open magmatic system with the involvement of geochemically different components. The apparent geochemical changes of the melt occurred during eruptions of the Holocene volcanoes both in Jingpohu and Wudalianchi. Unlike the rocks from Central Mongolia, those from NE China are depleted in high-field-strength elements (Nb, Ta, Ti). Liquids of the former region were generated by adiabatic decompressional melting, while those of the latter were produced by the additional effect of aqueous fluids. The decompressional melting mechanism hypothesis is based on the definite structural control of volcanic activity in Taryat first by strike-slip movement in the EW zone, as a direct reaction to increased tectonic stress from the Indo-Asian collision zone, and then by orthogonal extension relative to collision-derived compression. Accordingly, deep adiabatic decompression resulted in initial small-degree of partial melting in mantle peridotite (1.5–3.0%) and subsequent increased melting up to 5%. Magma generation via fluid fluxing began in NE China subsequent to the structural reorganization. The volcanic eruptions in Jingpohu occurred at the advanced stage of Holocene magmatic evolution in NE China and exhibited initial melting of approximately 2% beneath Frog Pool volcanic center, along with increased partial melting and subsequent overall increase in melting up to 5% beneath Crater Forest line. Volcanic eruptions in Wudalianchi reflected more delayed magmatic processes. Barry T.L., Saunders A.D., Kempton P.D. et al. Petrogenesis of Cenozoic basalts from Mongolia: evidence for the role of asthenospheric vs. metasomatized lithospheric mantle sources, J. Petrol., 44, 55–91, 2003. Barry T.L., Ivanov A.V., Rasskazov S.V. et al. Helium isotopes provide no evidence for deep mantle involvement in widespread Cenozoic volcanism across Central Asia, Lithos, 95, 415–424, 2007. Bayasgalan A., Jackson J., and McKenzie D. Lithosphere rheology and active tectonics in Mongolia: relations between earthquake source parameters, gravity and GPS measurements, J. Geophys., 163, 1151-1179, 2005. Castillo P. The Dupal anomaly as a trace of the upwelling lower mantle, Nature, 336, 667-670, 1988. Chuvashova, I.S., Rasskazov, S.V., Brandt, I.S. et al., Isotope geochemical characteristics of different-age late Cenozoic volcanic rocks in the Taryat Basin, Central Mongolia, in Isotope Dating of Mineralization, Magmatism, Sedimentation, and Metamorphism. Proc. III Russian Conf. on Isotope Geochronology, Moscow: GEOS, 2, 401–405, 2006. Chuvashova, I.S., Rasskazov, S.V., Yasnygina, T.A. et al., Holocene volcanism in Central Mongolia and NE China: asynchronous decompressional and fluid melting of the mantle, J. Volc. Seismol., 1, 372-396, 2007b. Fukao, Y., Obayashi, M., Inoue, H. et al., Subducting slabs stagnant in the mantle transition zone, J. Geophys. Res., 97, 4809–4822, 1992. Hsu, C.-H. and Chen, J-C., Geochemistry of late Cenozoic basalts from Wudalianchi and Jingpohu areas, Heilongiang Province, NE China, J. Asian Earth Sci., 16, 385–405, 1998. Liu, J. and Taniguchi, H., Active volcanoes in China, NE Asian Studies, 6, 173–189, 2001. McDonough, W.F. and Sun, S.-S., The composition of the Earth, Chem. Geol., 120, 223–253, 1995. Rasskazov, S. and Taniguchi, H. Magmatic response to the Late Phanerozoic plate subduction beneath East Asia / CNEAS Monograph Series No. 21. Sendai: Tohoku University - Institute of the Earth’s crust, 156 pp., 2006. Rasskazov, S., Chebykin, E., Chuvashova, I. et al., Isotope disequilibrium of 238U-series in latest Pleistocene through Holocene volcanic rocks from Hangay, Central Mongolia and Eastern Sayans, Siberia, Geophys. Res. Abs., 10, 04872, 2008. SRef-ID: 1607-7962/gra/EGU2008-A-04872. Rasskazov, S.V., Logachev, N.A., Kozhevnikov, V.M. et al., Stage dynamics in the upper mantle of East Asia: relationships between migrating volcanism and low-velocity anomalies, Doklady Earth Sciences, 390, 492-496, 2003. Rasskazov, S., Taniguchi, H., Goto, A. et al. Magmatic Expression of Plate Subduction beneath East Asia in the Mesozoic through Cenozoic, NE Asian Studies, 9, 179–219, 2004. Romanovsky, N.P., The Pacific segment of the Earth: Deep structure, granitoid ore–magma systems, Khabarovsk: ITiG DVO RAN, 1999. Shaw, D.M., Trace element fractionation during anatexis, Geochim. Cosmochim. Acta, 34, 237–243, 1970. Staudigel H., Park K.-H., Pringle M. et al. The longevity of the South Pacific isotopic and thermal anomaly, Earth Planet. Sci. Lett., 102, 24-44, 1991. Wang, Y., Chen, H. Tectonic controls on the Pleistocene–Holocene Wudalianchi volcanic field (NE China), J. Asian Earth Sciences, 24, 419–431, 2005. Wang, Y., Mu, L., and Liu, W., Regularity and characteristic of volcanic activity at Wudalianchi, Heilongjiang, Proc. 30th Intern. Geol. Congr., Beijing, China, 14 pp., 1996. Yanovskaya, T.B. and Kozhevnikov, V.M., 3D S-wave velocity pattern in the upper mantle beneath the continent of Asia from Rayleigh wave data, Phys. Earth Planet. Int., 138, 263–278, 2003. Zhang, Y., Quaternary volcanic activity in China, in The Quaternary of China, Beijing: Science Press, 274–306, 1991. Zhang, M., Suddaby, P., Thompson, R.N. et al., Potassic rocks in NE China: geochemical constraints on mantle source and magma genesis, J. Pet., 36, 1275–1303, 1995. Zhang, C.L., The characteristics of Cenozoic distribution in Jilin Province, in 30th Intern. Geol. Congr., Beijing, China, 10 pp. 1996. Zhang, Z., Feng, C., Li, Z. et al., Petrochemical study of the Jingpohu Holocene alkali basaltic rocks, NE China, Geochem. J., 36, 133–153, 2002. Zou, H., Zindler, A., Xu, X. et al., Major, trace element, and Nd, Sr, and Pb isotope studies of Cenozoic basalts in SE China: mantle sources, regional variations, and tectonic significance, Chem. Geol., 171, 33–47, 2000. Zou, H., Reid, M.R., Liu, Y. et al., Constraints on the origin of historic potassic basalts from NE China by U-Th disequilibrium data, Chem. Geol., 200, 189–201, 2003.